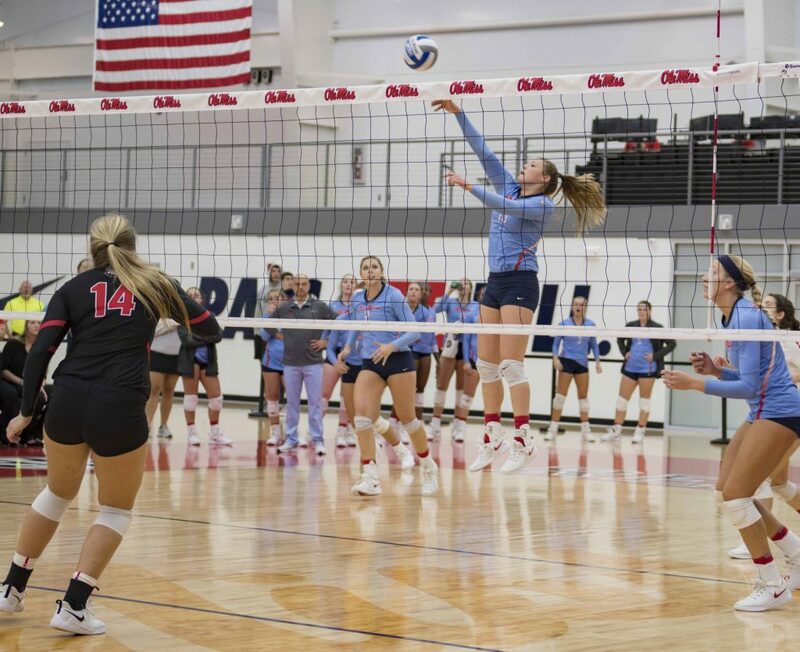 The Ole Miss volleyball team looks to win its only midweek conference match of the season when the Rebels take on LSU on Wednesday night in Baton Rouge. The Rebels came away with the win in their first matchup against LSU this season, a 3-2 thriller in Oxford that went down to the wire. In that match, junior outside hitter Emily Stroup recorded a then-career-high 30 kills on a .313 hitting percentage and 24 digs. Senior outside hitter Caitlin Wernentin also had a career-high, with 21 kills on a .300 clip. This was also the first match in which sophomore Lauren Bars took over the majority of the setter workload, resulting in a career-high 51 assists. This move has greatly benefited the Rebels, as Bars’ height and versatility provide opportunities for both blocks and surprise kills out of the setter position. This emotional, grueling performance resulted in the Rebels’ first SEC win. They are now looking to take that intensity to the Tigers’ home court and, hopefully, pick up their second road win in SEC play. LSU is 9-14 this season and 4-8 in conference play, currently sitting in a three way tie with Georgia and Arkansas for eighth in the SEC. With limited opportunities remaining to gain ground in the SEC, the Rebels will need to pick up a win to inch closer to the middle of the SEC standings. LSU enters the match as the winner of two matches in a row, including a sweep of Mississippi State on Nov. 2. With a tough slate of matches ahead for the Tigers, a win here for Ole Miss could help them slip past LSU and into the middle tier of the SEC. The Rebels are coming off of a disappointing weekend in which they dropped matches against No. 11 Kentucky and No. 23 Tennessee but saw a silver lining in the outstanding play from Stroup. Stroup recorded a career- and program-high 31 kills on Friday night against the Volunteers, a night in which she also recorded her 1000th career kill as a Rebel. On Sunday, Stroup broke the school record for kills in a single season (475), a record she set just a year ago as a sophomore. For this performance, Stroup was named SEC Offensive Player of the Week, her first-ever weekly conference award. She is currently second in the nation in total kills, third in total points and tenth in kills per set. She has 50 more kills and 22 more total points than any other player in the SEC, making her a sure-fire lock for the All-SEC team. After the LSU match, Ole Miss will face Texas A&M on Sunday on the road in College Station.